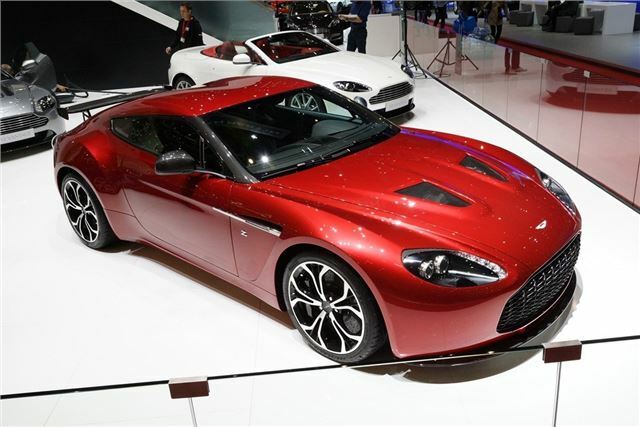 Aston Martin has unveiled the production version of the V12 Zagato at the Geneva Motor Show. The pinnacle of the Vantage range, the new Zagato is on sale now at a mere £330,000 with the first cars due to be delivered at the end of 2012. Production will be limited to just 150 models ensuring this will be one exceptionally rare and sought after car. Hand built at Aston Martin's headquarters in Warwickshire, it features a handcrafted aluminium and carbon fibre body - the bonnet, signature ‘double-bubble’ roof and doors are hand-crafted aluminium, while the front and rear wings, door sills and boot lid surround are made from carbon fibre. The special roof is made up of five separate pieces. Each car takes around 2000 man hours to complete and four unique colours have been created for the new model - Scintilla Silver, Alloro Green, Alba Blue and Diavolo Red in the pictures. The painting process alone takes some 100 hours. Designed as a purely driver-focussed car, the V12 Zagato is powered by a 6.0-litre V12 engine producing 510bhp (517 PS) and 570 Nm of torque. Inside the leather interior gets a semi-aniline finish for durability while hand-stitched quilting creates a flowing pattern across the seats and headlining. Z embroidery in the headrests and rear parcel marks it out as a Zagato model plus there is satin-finish carbon fibre on the dashboard and centre console with piano black accents and satin black switches.